Here are Herriman's offerings for May 8 and 9 1907. He's still covering the big Shriner convention. What I find interesting in this whole series of cartoons is that George is having a lot of fun with dialect and wordplay, later a hallmark of his Krazy Kat. The weird names all over the second cartoon (Zem Zem, Anezeh, Murats, etc.) are various local chapters of the Shriners. The ostrich business, on the other hand, I can't interpret. Hello, Allan----Back in those days, a big tourist attraction in southern Calofornia were it's ostrich farms, and the visiting shriners no doubt paid a visit. Some farms gave guided tours, let you see the incubators, served lunch, and gave ostrich-powered wagon rides. The need for so many ostriches was, of course, the large demand for their feathers in ladies' hats.-----Cole "Ostrich Lore" Johnson. Ah, an eggselent eggsplanation. That really took nostrich of the imagination to figure out for such an eggsbird as you I eggsclaim. Here's two more from the Chicago Defender. 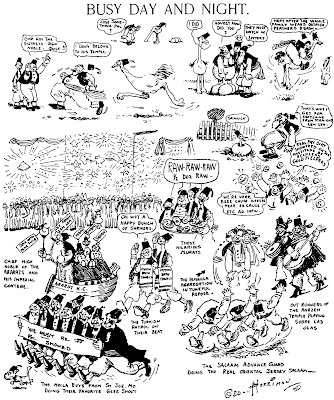 Bungleton Green was the paper's longest running strip. 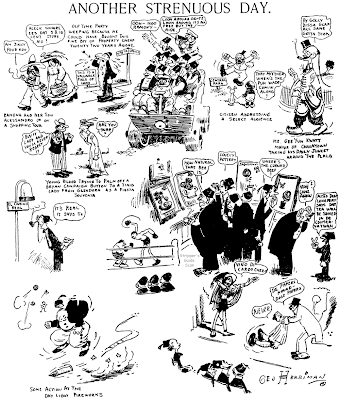 It was created by Leslie Rogers in 1920 and went through a long roll call of cartoonists before finally ending in 1968. Here are two samples, one by Jay Jackson from 1937, the other by Henry Brown in 1950. There's a lot to tell about this strip, but I'm saving that up for the book I want to write on the comics of the black papers. The Sparks was a delightful domestic comedy by Chester Commodore; it ran from 1948 to 1962. 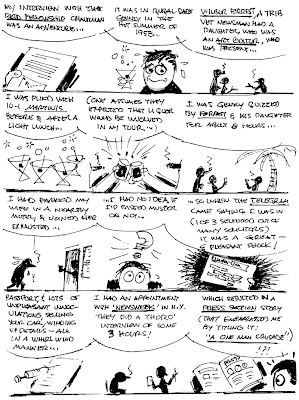 The original title of the strip was literally Nameless; the Defender ran a contest to name the new strip, and The Sparks won the competition after four months of gathering entries. Great samples from the two Bungleton Grren strips, mainly those numbers that he using for lottery picks! To welcome our new African-American president (who I'm sure follows this blog regularly) here are a few features produced for Barack Obama's biggest booster in Chicago, the Chicago Defender. Next we have Ravings of Professor Doodle, another Defender feature that was created by Jay Jackson. 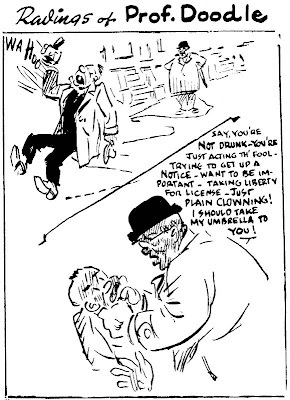 Doodle was a latter day Everett True; he took it upon himself to rather vigorously enforce his standards of propriety on all who had the misfortune to cross his path. There were quite a few features of this sort in black papers in the 40s and 50s that were meant to gently, or not so gently, tell blacks to behave better if they wanted to be treated with respect by whites. Our example here is from well after Jackson's short tenure; this one is by Henry Brown. Chester Commodore also worked on the feature after Jackson. 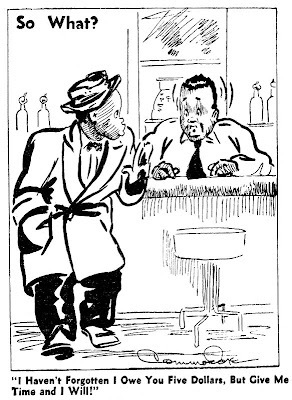 Li'l Smart Alex was a short-lived kid feature by Henry Brown. It ran 1950-51. 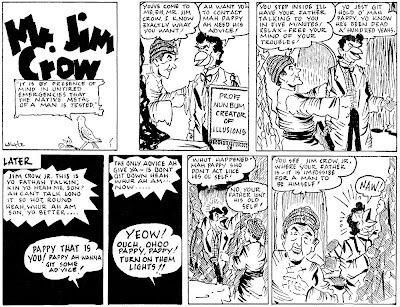 The Notorious Mr. Jim Crow is a pointedly political strip about a racist Southern politician. 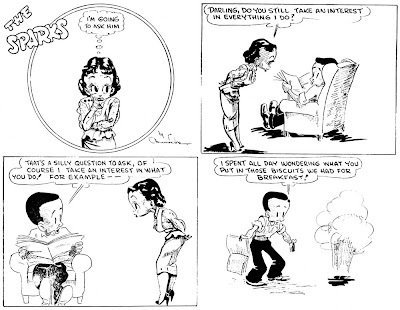 The strip was penned by Garrett Whyte and ran from 1946 to 1951. Crow's speech pattern is lifted from the Senator Claghorn character of the Fred Allen Show, the same distinct voice we remember better today when it was appropriated by Foghorn Leghorn in the Warner Brothers cartoons. After walking hundreds of miles over the past month and knocking on thousands of doors I arrived home after the polls closed last night and fell asleep before any results were in. By some small miracle I awoke at midnight to hear Barack Obama's inspiring victory speech. Judy and I wept with joy to know that our country has chosen the right path to the future, one in which the rest of the world is not seen as a long list of enemies to be battled, but as a roll call of friends and potential friends. Frankly I had just about written this country off as having fallen completely under the spell of neo-conservative right wing fundamentalists, but as it turns out our mighty beacon of freedom, hope and liberty still burns. Although I had dared to hope that the margin of victory would be much wider than it was, I'm confident that the next four years will be a turning point in showing our people that this past eight years of fear-mongering and xenophobia were just a brief nightmare and that we have awakened to a new dawn, a day when the United States of America regains its rightful position as a country to be admired and emulated by the rest of the world. 1000th Post -- Important Message! V O T E !! See you after the election -- I have many more doors to knock on before I sleep again. Unbelievable! Everytime I visit your site I'm awed by the wonderful things to be found here! I hope you don't mind if I again swipe a few samples for my own blog. I promise to direct as many people as I can back here. Absolutely marvelous blog. I am in the process of researching the Lincoln Syndicate, and a few interesting strips from the Eisner/Iger studio. We are planning some major books based on some very rare series. Contact me off list at tlasiuta@telusplanet.net for some great Eisner, Iger, Kane, Bailey, and Weiss panels.